The images accompanying the news stories at Christmas always seem discordant with those of the Christmas stories. This year the dissonance is particularly striking. The riot shields and special forces in Paris, the wall dwarfing Bethlehem, the bombers preying on Syria, the electronic surveillance everywhere, all suggest a dystopian world of mistrust and fear. The Christmas stories of the birth of a child in the fields speak of hope and trust; the angels sing of peace and harmony. Of course the pastel coloured domesticity of the images of Jesus' birth does not do justice to its context. 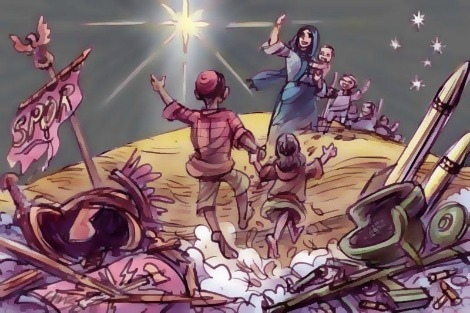 Herod's sending out first his spies to find where the Messiah was to be born, and then his soldiers to eradicate the threat the child posed to national security, may not appear on Christmas cards, but they frame the story of Jesus' birth. The disjunction between the tenderness of the Christmas stories and the brutality of their public context is mirrored in the conflict between the humane values of the Gospel and the harsh instrumental values of the public world in any age. The spirit of Christ's birth and the spirit of Herod's security sweep continue to coexist. A small but telling example of this dissonance was a decision by the Australian Border Force. It banned the longstanding practice by which the Brigidine Sisters took children held in a Melbourne Detention Centre out on picnics. These outings have been much enjoyed by children, whose mental health is seriously at risk through detention. They can enjoy the smells and sights of animals at the children's farm and taste a world unconfined by fences. One of the sisters involved explained, 'It is essential to give these kids some normality away from people who are scared, anxious and depressed all the time.' As one might expect in events organised by sisters with a life-time's experience in teaching, the outings have been entirely safe. They embody the humane spirit of the Christmas stories. The response of the Australian Border Force ignored the children and emphasised the demands of security. These outings, a spokesperson said, were not 'appropriate' to the security of detainees and staff, and offered only limited supervision. But, we were assured, the officers would offer excursions. How children would find normality in excursions in which the guards were focused on providing unlimited security was not explained. To the cynical outsider it all sounded like Herod sending out his soldiers after the security cull to organise a picnic for the mothers and surviving children of Bethlehem. At one level this was a standard story of any bureaucracy enjoying impunity. But more deeply it suggests why the Gospel stories are deeply subversive of state priorities. They take it for granted that Herods will exist with the overriding passion for security at all costs, and that we need to live with their unbridled power and lack of respect for humanity. But they urge us not to take the Herods of our world seriously. We are rather to respond to the simple humanity of children and adults. The overarching story which frames the stories of Jesus' birth make clear the reasons for disdaining security as a controlling human value. It describes a Son of God who entered our world and shared our life as a vulnerable child, dependent on the vicissitudes of health, climate and supportive adults. He offered a vision of human life that challenged the illusory security offered by inherited traditions and overwhelming force, and sought the company of people who lacked secure reputation and resources. He died as he lived — unarmoured, uncompliant and trusting. He was caught in a successful security operation that had him discredited, tortured and put into a grave with a rock to seal its entrance and guarded by soldiers to ensure he stayed down. And, of course, trust and passionate life proved stronger than the best planned security measures. The stories tell how God rates security. This Christmas, as so often in his short time as Pope, Francis has embodied the Gospel priorities in simple ways. On his journey to the people of war-torn Congo, undertaken despite warnings of its insecurity, he joked that if the pilot of his plane thought it too dangerous to land he could send the Pope down by parachute. As an image of what Christmas is about, that beats Santa Claus gliding down on his sled. More than any other story, the story of our Saviour's birth is one that shows the great love, and deep respect, God has for humanity. To approach us in the humblest way possible, to give priority to those who could not hope to be first in any situation, and to face persecution so very early in life, points to a God who gives all. This is a great contrast with over the top security measures, mistrust and suspicion. The Pope landing via parachute or Santa on his sleigh? Safe landing, Your Holiness. Thank you Andrew for this timely reminder of how our times compare to that year about 2222 years ago when Christ The Saviour sent from his Father God was born. Looking back on my own "Christmas Experiences" that are only .04% of the time expired since "The word became flesh" I recognise changes in my limited space on earth that maybe do not seem to have changed from the stiff neck attitudes that existed inJesus' time. Herod and those in power at the time of His birth seem to have been deeply divided views on the benefits to the general population on the coming of The Saviour forecast by prophets since the time of Abraham. Herod who, with some interptetive licence, may be likened to our current world governance, feared The coming of the prophesised God's Saviour as a threat to his power and dominance of his people. He feared the coming of The Christ would take away his opulent and Roman supported human kingship. On the other hand his subjects were awaiting Christ's birth to relieve them from Rome's oppression, taxes and their subservience to foreign rule. Niether of them were correct! The birth of Jesus has always seemed a rather discordant note to the glib certainties of those who wield earthly power and have great wealth. To change they need to undergo the sort of psychological process Scrooge did in 'A Christmas Carol'. If most clergy who will preach this Christmas possessed the persuasive powers of Charles Dickens they could change the world. Pope Francis is a sort of living sermon - an exemplar - of what it's all about. The Christmas message is so simple I'm amazed so many people, including supposedly 'religious' ones, just don't get it. Good Morning Pam. I do so love your early morning responses that mostly mirror my own. May God bless you and keep you throughout 2016. This just reinforces my view that Australia is far from a country that follows it's "Christian values" or "heritage". Who in Canberra follows Christ? Re my comment 16/12. An extra 2 seems to have crept into the time since His birth. Obviously occurred 2022 years ago. Born to Mary and Joseph 7BC. It is good to meditate upon the Gospel (Good News) of the Birth of Jesus. It has its joyful and its sorry side. Indeed if we didn't know how the story ends we could be forgiven for thinking this is too amazing to be true. God the Son has emptied Himself of His Divinity and become human being like us. He didn't suddenly materialise as an adult but went through the whole human process from conception, birth, growth, adolescence, maturity up to an early death by execution on a cross like a common criminal. The Church in its liturgy of The Word takes us through this life every year. There is a time for Joy and a time for Sadness. But we know the constant backdrop is persecution of the Good Man who perseveres to the end. There was no shortage of men, especially those in power, either secular or religious, who tried to stifle the spirit of Jesus of Nazareth. Such men (and women) exist today. They try by sundry means to stifle the spirit of Jesus that lives on in Christian families, parishes, religious orders and institutions, and, thanks be to God, in Pope Francis. Merry Christmas everybody! Wishing all who sail in the good ship Eureka the peace, love and renewal that comes with the birth of innocence and goodness in the Christ child. Great article. I would like to donate but your Trybooking site will not accept number of donations. Hi Patricia, blessings to you & I look forward to your comments in 2016! Thank you Andrew. This should be read on Christmas Day in every church. It gives a realistic perspective that is often submerged by the "chocolate box" stuff. It's said that fear, not hate, is the opposite of love. Fear causes stress. It's sensible to make sure that fears are not illusory. Herod's fear was. He didn't know that Jesus' kingdom was not of this world and could have coexisted with his dynasty. His assumption of material threat resulted in the slaughter of the Holy Innocents and risked his soul. Is the "Muslim caliphate" a material threat? Syria, relative to other Muslim states, is not a particularly rich and powerful prize. The head of ISIS and the new boss of Syria (if he wins) can crown himself caliph just as Jean Bedel Bokassa crowned himself Emperor of the Central African Empire (now the Central African Republic and probably the poorest country in the world) but what will it mean? Will Shia Iran and its nuclear potential kowtow to a Sunni caliph? Will Sunni Pakistan and its actual nuclear capability kowtow to a nuclear-less caliph? Will Saudi money be the (poorer) caliph's money? What about Egypt, which sees itself as the senior Arab state (and domestically represses the Muslim Brotherhood)? When, as with Herod, mistakes borne of fear can result in serious sins, prudence suggests that fears be reality-checked. God looked down from Heaven and was not pleased with the un-godly behaviour on display, So 'He' sent an Angel to find out why his wishes for his Children were not being observed. The Angel reported back, 'But Lord, what is being done is being done in your Name'. The Angel was sent back to find out how there could be so great a misunderstanding of what God wanted of his Children. The explanation was that the Children were scattered around the base of the Mountain, but to reach the top, each had to pass through very different terrains, and this led to vastly different Traditions. Those who had to pass through swamps claimed boats were needed to scale the Mountain. With deserts, large water bottles were essential, boats were despised. With jungle, weapons were needed. Those following water courses rejected weapons and water bottles as hindrances. Each could think only of their own needs and traditions and was bonded to them, and blind to those of 'others'. God said, "Let there be Light." And added "Let there be the Light of Love." "Put aside man-made Traditions" . Recognise that all are fellow Children of God, and respect any differences." Thank you Andrew for holding out to us the Gospel reality, Gospel joy and trust in the harsh reality of our time. The story in cathnews of the Romanian lay woman who spoke up at the synod on the family tells the same message. She knew joy in family and faith, growing up in very harsh Communist regime. Father Andrew, I share your concerns about the state citing security to justify an unchecked and unchallenged growth in its power. However, I don't see that the story of Herod, the Magi and the massacre of the Holy Innocents as an example of this. Herod simply wanted to keep his own power. In this short gospel story, of highly questionable historicity, feigned concerns for the security of his subjects are not ascribed to Herod. You are reading a meaning into this gospel story that is simply not there. Again I stress I agree with the main thrust of your piece. But I am concerned about more than just the security state. I am worried about the expansion of the state full stop, whatever guise it appears under. Therefore let us be ware of the security state, the welfare state, the nanny state, the whatever state. Sr. Brigid and her nuns gave life to those young innocent children whose minds are being formed at a critical time in their development. To stop their outings is cruel. And a time will come in the future when Australia will be sorry for its treatment of children in detention. I so agree with this contrast between love and the powers-that-be which react in rigid, 'self-protective' ways that are harsh and inappropriate. This is a telling analogy between the birth of Jesus and Australia's treatment of refugees. May love prevail! Mr Lanigan while I have no problems re the historicity of the Gospel event, in macabre fairness to Herod biblical archaeologists note: "The number killed by Herod has often been exaggerated as being in the thousands. In so small a village as Bethlehem, the actual number was probably not large — although the act was no less brutal"